Vivo NEX S Specifications Leaked; Reveals Snapdragon 710 SoC, 20 + 16 MP Dual Cameras and More - Playfuldroid! Recent reports have revealed that there are three editions of the Vivo NEX smartphone such as Vivo NEX, Vivo NEX S and Vivo NEX A. It is speculated that one of them could be a China-exclusive variant whereas the other two may also get unveiled in other markets. The Vivo NEX S could be budget phone while the Vivo NEX A could be an advanced flagship phone. A leaked image with the key features of the Vivo NEX S smartphone has appeared today to confirm that it will be arriving with Snapdragon 710 SoC. As it can be seen in the below image, the smartphone features a 6.01-inch display that supports FHD+ resolution. The Snapdragon 710 that includes an octa-core processor that clocks at 2.2 GHz is present under the hood of the phone. It has a selfie camera of 24-megapixel and a dual camera setup that includes a 20-megapixel primary sensor and a 16-megapixel secondary sensor. The SoC is coupled with 4 GB of RAM and the internal storage of the phone is 64 GB. It is packed with a 3,320mAh battery and is preinstalled with Android 8.1 Oreo. Rumors have suggested that the Vivo NEX S will be having a front-facing camera at the corner of its bottom bezel. The advanced Snapdragon 845 model may have a popup selfie camera. 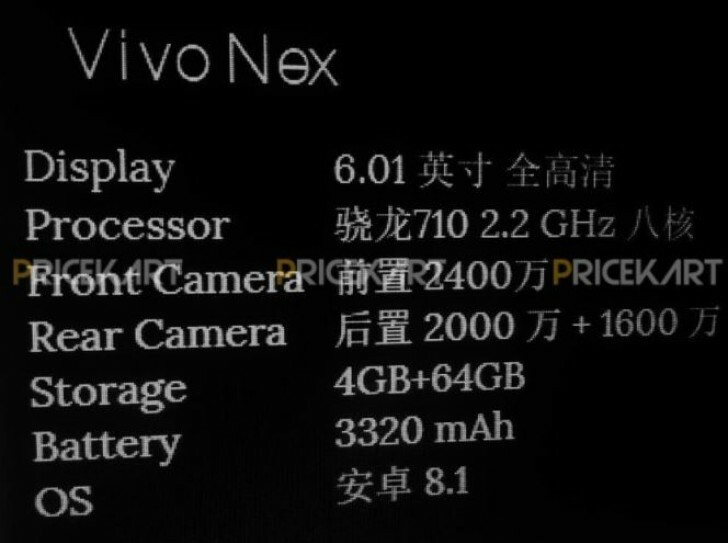 Vivo has confirmed that it will be debuting the Vivo NEX phone on June 12. Until then, the company will continue to tease the features of the smartphone.